We’ve got a special, unexpected treat for you today – we’re kicking off a long-awaited Richelle Mead Book Blog Tour, in honor of her most recent release, the fourth book in her ongoing Vampire Academy series, Blood Promise! Rose Hathaway’s life will never be the same. The recent attack on St. Vladimir’s Academy devastated the entire Moroi world. Many are dead. And, for the few victims carried off by Strigoi, their fates are even worse. A rare tattoo now adorns Rose’s neck, a mark that says she’s killed far too many Strigoi to count. But only one victim matters . . . Dimitri Belikov. Rose must now choose one of two very different paths: honoring her life’s vow to protect Lissa—her best friend and the last surviving Dragomir princess—or, dropping out of the Academy to strike out on her own and hunt down the man she loves. She’ll have to go to the ends of the earth to find Dimitri and keep the promise he begged her to make. But the question is, when the time comes, will he want to be saved? Now, with everything at stake—and worlds away from St. Vladimir’s and her unguarded, vulnerable, and newly rebellious best friend—can Rose find the strength to destroy Dimitri? Or, will she sacrifice herself for a chance at eternal love? For the duration of the tour, six blogs will be participating in an interview with author Richelle Mead, asking her our burning questions about her Vampire Academy books. Without further ado, ladies and gentlemen, we give you our questions with Richelle! The Book Smugglers: You have a thing about putting your heroines through hell and back – both Georgina in your Succubus series and Rose in Vampire Academy have to deal with some major heartache. What’s with the Angst? Will Rose have some relief in the future? Richelle: I’m not a cruel person, but I do believe characters have to work for their happy endings. It’s also unrealistic to write a book in which everything that happens to the character is happy and wonderful. No one would want to read it! We like to go through the ups and downs. And as for Rose, well…that’s not something I can give away. You’ll have to keep reading to see what happens next. The Book Smugglers: Your take on vampires is really detailed, with careful and thoughtful delineation between Dhampir, Moroi and Strigoi. What were your inspirations for your particular take on vampire lore and hierarchy? Did you do any specific mythological research for your world building in the Vampire Academy books? Richelle: When I sat down to write a vampire book for teens, I had no idea that that genre would be so big. I knew the adult market was going strong, though, so it was important for me to do something very different from those books. So, I tried to stay away from the ‘standard’ vampire stories in our culture and see what else was out there in the world. Interestingly, almost every culture has myths about some type of vampire. I’d taken Eastern European folklore classes in college, so I jumped into research about those myths first and found the Moroi and Strigoi stories. There wasn’t a lot there, so I’ve had to improvise a lot in the series with how I best think a world with two vampire races would live. Dualism is a big part of Russian and Romanian myths, which is why the balance of light and dark is always so key in the Vampire Academy universe. The Book Smugglers: What are your future writing plans for the Vampire Academy books? When can we expect (and what can we expect from) the next installment to this fabulous series? Richelle: There are going to be eight more VA books coming out over the next few years. Two of them will be about Rose and will finish off her story. The next six will be a “spin-off” starting a whole new story that takes place in the same world but follows different characters (whom we’ve already met). Scorpio Richelle Mead is a New York Times and USA Today bestselling author of urban fantasy books for both adults and teens. Originally from Michigan, Richelle now lives in Seattle, Washington where she works on her three series full-time. Before becoming a writer, she considered a few different career paths. She received a liberal arts degree from the University of Michigan, an MA in Comparative Religion from Western Michigan University, and a Master in Teaching (Middle & High School English) degree from the University of Washington. In the end, she decided writing was the way for her but believes all of her education prepared her for it. Visit Richelle Mead online at her website http://www.richellemead.com/ or her blog, Even Redheads Get the Blues. 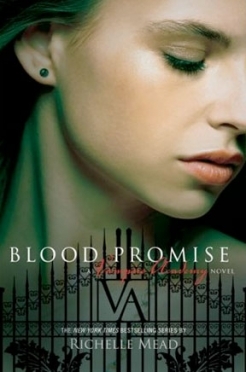 Also make sure to check back in on Monday, when we’ll have a review of Blood Promise and a giveaway to boot! Thank you for the interview with Richelle. I’m glad to know there is going to be EIGHT more VA books! What a cool surprise! I can’t believe it! Eight VA books? Whew, I need to calm down and catch my breath. Have you guys seen the foreign covers for Ms. Mead’s books on her website? They are stunning. I wonder how I could get one, or two (all of them). YAY!! MORE BOOKS FOR THE VAMPIRE ACADEMY!! I THOUGHT YOU JUST WERE GOING TO END IT LIKE THAT! !